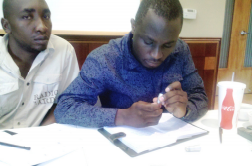 New York, NY, July 16, 2010 – Two young dental school technicians, William Mihayo and Haruna Matwili, from the Muhimbili University of Health and Allied Sciences Dental School (MUHAS) in Dar es Salaam, Tanzania recently completed three weeks of technical training in three US cities. The training was sponsored by leading US dental manufacturing and supply companies, Dental Components International (DCI), Midmark, Sirona and Henry Schein, Inc., and facilitated by Miracle Corners of the World (MCW). The goal of the visit was to train the technicians to maintain and repair equipment donated to MUHAS in 2009 as part of a larger effort to renovate and upgrade the dental school, as well as to provide them with the knowledge and skills to train future technicians in Tanzania. At the DCI facility in Newberg, Oregon the two technicians learned how to repair and maintain the dental chairs and units donated by John Spencer, CEO of DCI, and his family. In March 2009, Mr. Spencer led the team of US technical experts, who traveled to Tanzania to install the dental equipment. From Newberg, Mihayo and Matwili traveled to Sirona’s facility in Charlotte, North Carolina, where they learned about maintaining the x-ray equipment. 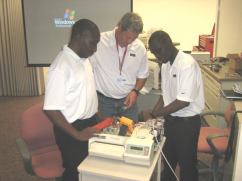 The tour ended at Midmark’s facility in Versailles, Ohio, where Jeff Sanders who installed the Midmark-donated cabinetry, ultrasonic cleaners and sterilizers in Tanzania, trained the young technicians in maintenance and repair. In addition to the training, the technicians learned about life in America. “They worked all day and, in the evenings, Jeff took them bowling and horseback riding. They were also at a putt-putt and a minor league baseball game,” said Dr. Eiting-Klamar. The training project builds on a September 2008 memorandum of understanding between MUHAS and Miracle Corners of the World (MCW) on a collaborative oral healthcare initiative. Tanzanian President Jakaya Mrisho Kikwete and the Ministry of Health, under the leadership of Health and Social Welfare Minister David Mwakyusa, supported the project from the beginning. Ron Appel, Henry Schein, Inc.
Jules Paoletti, Henry Schein, Inc.
Joe Schartung, Henry Schein, Inc.
To view pictures visit http://www.flickr.com/photos/miraclecorners/sets/72157624508885430/. ship Training, Community Center, and Partner Initiative programs (Oral Healthcare, Genocide Prevention, and Container initiatives). For more on MCW, visit www.miraclecorners.org.